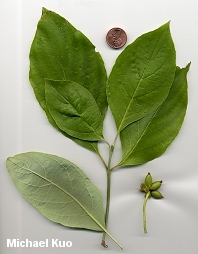 Bush-like understory tree with plate-like mature bark; simple, toothless and opposite leaves with deep veins; spring flowers with 4 prominent, white bracts; growing east of the Mississippi River. Habitat: Understory tree typically mixed with other hardwoods; growing east of the Great Plains. Stature: Rarely 40 feet high; to 1 foot in diameter; spreading and bush-like. 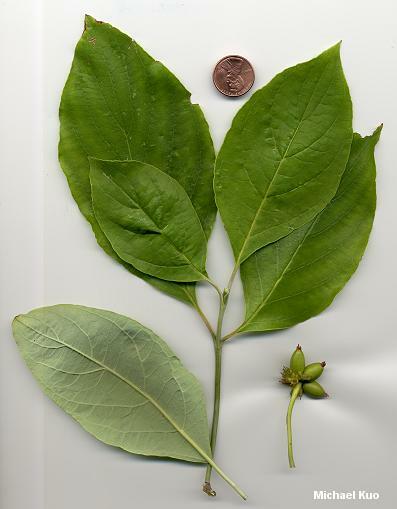 Leaves: 3-6 inches long; pointed-oval; simple; toothless; with prominent veins that arise from the lower two-thirds of the central vein; bright green above; pale green below (scarlet in fall). 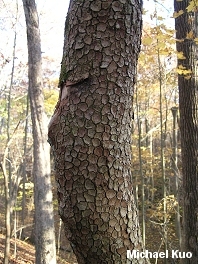 Bark: Dark reddish brown; when mature broken into distinctive, squarish plates. Flowers: Inconspicuous, but surrounded by four large white bracts (often construed as a "flower"); fruits in clusters, reminiscent of pointy green olives, becoming scarlet with maturity. 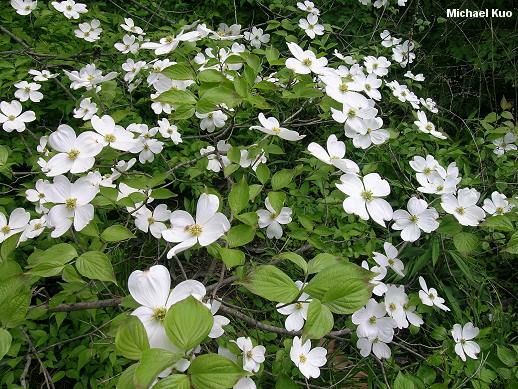 Since flowering dogwood is an understory tree in a variety of eastern forests, many mushrooms appear in its vicinity; whether these are mycorrhizal with the dogwoods or the canopy trees is up for grabs. I frequently find Daedaleopsis confragosa on the wood of flowering dogwood.